The aim of the AgShare Planning and Pilot Project was to create a scalable and sustainable collaboration of existing African organizations to publish, localise and share teaching and learning materials that would fill critical resource gaps in African MSc agriculture curriculum. An additional objective was to ensure that these high quality publications would lend themselves to modification for other downstream uses. The 18 month AgShare planning and piloting initiative was conceptualised by OER Africa and Michigan State University (MSU) and funded by the Bill & Melinda Gates Foundation. Haramaya University, Ethiopia: Creation of a comprehensive set of course materials to be used within its MSc in Agricultural Information Communication Management (MSc AICM). AICM is one of the regional postgraduate programs implemented through the Regional Universities’ Forum for Capacity-Building in Agriculture (RUFORUM). Makerere University, Uganda: Improve the efficacy of the dairy value chain through utilization of OER in Uganda. This pilot was jointly implemented by the university’s Agribusiness and Management Program and its Livestock Development Program. Collaborative Master of Science in Agricultural and Applied Economics (CMAAE): Haramaya University and Moi University (Kenya), both members of CMAAE, produced two case-study based modules on a selected commodity (coffee for Ethiopia and maize for Kenya), to demonstrate the economic role of prices and approaches to the study of agricultural market organization. These modules were made available to the entire CMAAE membership—in East, Central, and Southern Africa. 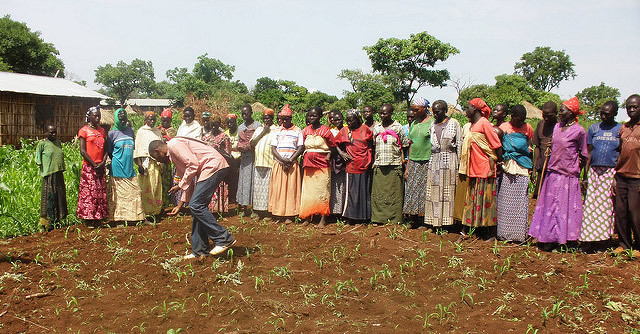 United States International University (USIS), Kenya: Develop a pedagogical model and framework for teaching farmers and farmer organizations to gain new knowledge and agri-management skills to transform their farming as a livelihood practice to farming as a business enterprise (from farm to firm).